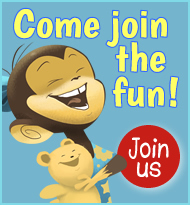 This lively community now has 1,030 friendly "keepers" of bilingual and multilingual kids from all over the world! 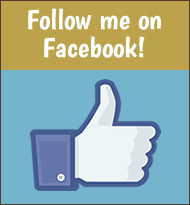 To join us, just register for a free account and see your inbox for a "welcome message" with further guidance. New to The Bilingual Zoo? Learn about becoming a member of this worldwide community, along with the goals, guidelines, and FAQ. 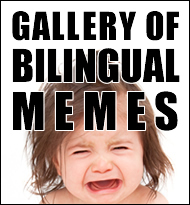 You'll also find links to the latest blog posts at Bilingual Monkeys and fun galleries of memes and infographics about raising bilingual kids. 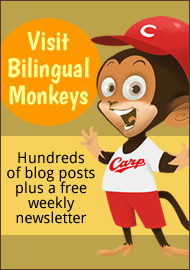 What do you think of The Bilingual Zoo and Bilingual Monkeys? Have some ideas for making them even better? 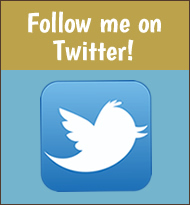 Challenges are designed to empower your efforts and boost your children's bilingual development. Try one (or try them all!) and tell us what happened. You want accountability? Tell us about your aims and your efforts. Share what you're going to do, then do it and report back on your progress. Help others stay on track by offering encouragement. Relax at the snack bar and talk about all things off-topic. Get to know one another a bit better. Free coffee and animal crackers. 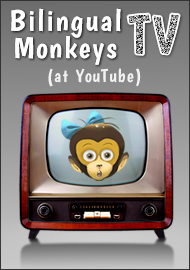 My two monkeys, Lulu and Roy (now 14 and 12), want to take part in our community, too! So feel free to ask them any questions you like--about their lives and their experience as bilingual children--and I'll have them respond. Your questions can be addressed to them as a pair, or individually. 28 99 What do you want to do when you grow up? 1 Staff, 10 Members, 277 Guests.